I have mentioned elsewhere on this site the potential unreliablity of MI9 escape reports, and used Gordon Laming's file as a prime example. This is what Gordon told Derek Richardson in 2003: "I suspect the interviewers were rather pushed for time and perhaps relied on their memory for finishing their notes afterwards, or maybe some of the escapers had hazy memories of very foreign names of places where they crossed into unoccupied France etc. and when perhaps prompted by the similarity of several stories, were ready to tie things up by agreeing "went with Laming". Not really so, but perhaps we should be charitable to the debriefed AND the debriefers." 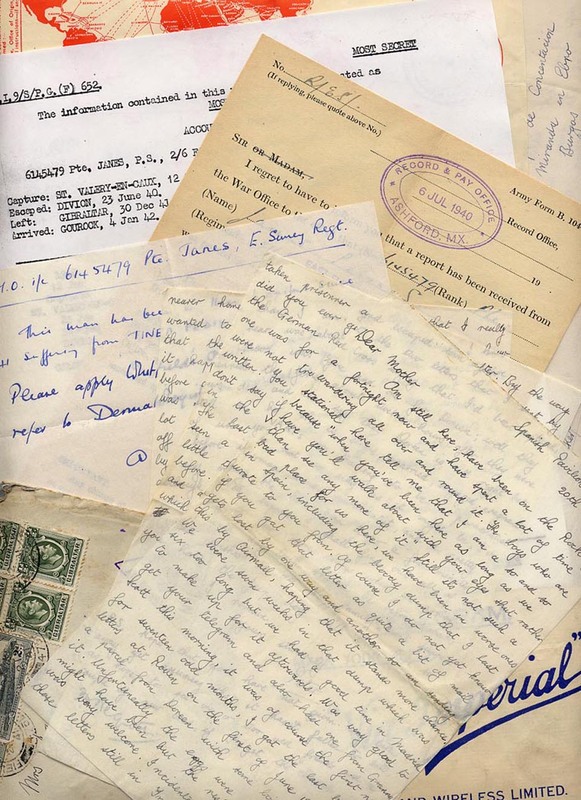 Gordon maintained contact with the French civilians, two families in particular, who helped him after his escape, and had written an account for the grandchildren of one of them. This was later enlarged to become the file that Gordon passed to ELMS in 2006 for their archives, and which I have used as my source. I have summarised the beginning of his story and slightly edited the rest. There is some additional information (much of it also from Gordon Laming) added in square brackets. Numbers in rounded brackets refer to the men's MI9 report numbers and indicate that those men got safely back. Some men were still interned by the French when Detachment W (DetW) was transferred to Italy in December 1942 and, as far as I know, they remained PoW to the end of the war. On Friday 10 May 1940, when the war in western Europe really began, Pte Gordon Laming was part of W Force, a small draft of RAOC men stationed at a forward depot at Woippy, on the northern outskirts of Metz. Living accommodation was in an old chateau - living conditions were primitive, but adequate. Thirty miles from the Siefried Line and tucked away behind the Maginot Line, they felt fairly safe. There was air activity that night and some AA fire but it was the Metz area that was the initial target, and for some weeks, the war seemed to pass them by. On 10 June, Gordon went to the local range and fired his first ever rounds from his Lee Enfield rifle. On 14 June, W Force and others (RAOC, RASC, Pioneers etc.) about a hundred men in all, were evacuated by rail southwards - just in time to avoid the German army which occupied Metz that afternoon. Their train was heading for Nancy but various delays meant that on 17 June they finally had to abandon it near Rigney. On 18 June, the major learned that France had asked for an armistice. He decided that the military situation was hopeless and it would have to be every man for himself. We were to jettison our rifles, taking out the bolt and throwing it away, and then go off in groups of our own choosing. L/Cpl John Cope (250) and Pte Ken Wight (299) and I went off together. The three WO1s and Sgt Stan Newell (307) formed another group. The major and lieutenant went with their batmen. I think a couple of small RASC contingents kept together under the command of their junior officers. Left to our own devices, we wandered through villages somewhat aimlessly, being told there were too many Germans to get across the main roads to Switzerland, and going south our chances were equally beset by hordes of Germans. People in the villages were very generous with food, but very apprehensive. In our wanderings we eventually bumped into another trio (Cpl D E MacGregor (later PoW) Tich Street [Cpl (sic) Charles E Street RAOC] and John Hosea) and as none of us had any practical plan, we stayed together. Wednesday 19 June at the village of Venise: we had a meal in a café and bivouacked in the woods. Some French troops surrendered to us - being unfamiliar with British uniforms, they thought we were Germans. On Thursday night to Palise then Buthiers and slept in pine wood near Bonnay. Friday was rainy and a kindly couple at Mérey-Vieilly took us all in, provided us with a five course meal and we slept in feather beds. Saturday 22 June: more rain, stayed at this house, well fed. On Sunday 23 June (my 21st birthday) the wireless announced that an armistice had been agreed. We furtively left the house very promptly amid thanks and misgivings. The Germans had a unit in the village - we had been told they were not immediately taking prisoners but telling troops they should go to Besançon and surrender. We said this was what we were doing. The ploy seemed a good idea, we would take to the road and see how far we got, much better progress than being lost in the woods. After a while we stopped at a café, partly because I had a raging toothache and hoped to get some relief from a tot of cognac. Here a German officer decided that it might be okay for French troops to go unescorted but not British - so that was that. We were taken by truck to the Fort de la Dame Blanche, just north of Besançon. Next day we were sent to the Frontstalags being set up in French barracks in Besançon itself. The first was Caserne Ruty where we settled into a third floor room and tried to make the best of it. There must have been two or three thousand prisoners, amongst whom were our major and lieutenant, but no other British. A few days later three Navy personnel (a CPO and two seamen who had been pushing mines into the Rhine) arrived and shared our room. Our two officers were soon moved and we never saw them again. The early days were difficult: the rations were meagre and we were hungry with just one meal a day for the first week. French army horses were tied to trees around the barrack square and one of these would be the ingredient for the midday soup. I made friends with a French soldier on cookhouse duty and he was liberal with the French army biscuits. We shared these amongst the nine of us. The Germans soon had the camp organised better and we were fed better. The French had various rackets going and life became less penal. The local French Red Cross took an early interest in us and after about three weeks, parcels of food and oddments of clothing started to come our way. As one misery diminished however, another arrived - we became lousy and there was no delousing facility at Ruty. The French prisoners were steadily being sent off to camps in Germany and so the congestion at Ruty eased. On Tuesday 6 August we nine and the remaining French PoWs at Ruty were marched across town to Caserne Vauban. There we met 80 or 90 other British, seemingly the whole of the rest of our train party. Later at Marseille there were just two of our party who had wholly evaded, the rest were all captured - not surprising in view of our bewildered innocence of the situation. Our training was to obey orders and in no way oriented towards coping well with the instruction "every man for himself". Caserne Vauban, later known as Frontstalag 142, was an improvement - there was less congestion and, crucially, a delousing facility for ourselves and our clothes, which we were immediately directed to. There were also shower facilities. The working parties were not too arduous. I think we were toiling in army depots, which I now think was contrary to the rules of the Geneva Convention but none of us knew what the rules were. A generous supply of parcels came from the local citizens via the local Red Cross and were a great comfort. From July to October, about two hundred came in between the nine of our group, which we shared regardless of the named recipient. On 22 October, two more men escaped. They were Pte A Grabini (381) and Pte Charles Street. Both men made it safely to the ZNO where they were arrested by the French and interned. Grabini escaped from St Hippolyte to cross the Pyrenees and got back to the UK in June 1941. Street was interned with Detachment W at Chambaran but removed in unknown circumstances. Information came into the camp that someone had come through the rainwater sewers from the outside and cut the barbed wire which sealed the entrance from the barracks. Four British departed this way on Friday night 25 October [Pte M Borst (313) Gnr H J Barham (370) Cpl F T Fox (484) and Pte J Maybank (253)] Another four [L/Cpl W E Clayton (426) Dvr C Jackson (252) 126754 Leading Seaman RC Turley RN (no info) and Pte George A E Bluett (DetW)] were going the following evening. We asked to go too and there was no objection so long as we gave them a start of about a quarter of an hour. So Ken Wight, John Cope, Stan Newell and I collected some food and such civilian shirts and trousers as we could find, so we could follow them. Both our groups got safely down into the sewer and a Staff Sergeant who was in the know, replaced the cover for us. We heard the voices of the other group and followed them. We found their army gear dumped under an exit and tried to get out there, but it was in the pavement of the main road, and since it was so exposed, we thought it must be wrong. We dropped the cover and carried on. The sewer varied between two and three feet wide but was mostly about two feet in diameter. It must have been about two and half hours later that we groped our way back and decided that however visible, we had to get out. We had crawled far enough, much of it in absolute darkness, seemingly downhill, I guess towards the river Doubs. We should have turned right under the barracks to come out as advised by the railway line instead of following the voices, but I only realised this years later after studying the maps. Fortunately we reached the safe house of Giselle Petolat, one of our regular food parcel donors, by 10.20 that evening. Next morning we moved on to another food parcel donor in the town. Then we were taken by car to stay with a family at Cussey-sur-l'Ognon for two nights. On Wednesday 30 October we were driven back to Besançon and rowed across the river Doubs in order to avoid the guards on the bridge. Our hosts paid our bus fare to Arbois, some 40 kms south. We waited at the Café de la Balance for our host who was to drive separately to Arbois and arrange for a passeur to take us across the demarcation line, but he never arrived. Eventually we decided to trust the patron of the café and he told us to go to the Café Rosa for help. Ken went to arrange this and we were duly taken across the line at dusk at the cost of 100FF plus Stan's gold signet ring. We spent a very cold night huddled in a hollow in the hills of the Forest of Arbois and were glad to set off southwards at daybreak. We were surprised to find other walkers in the woods. These were Frenchmen who wanted to get into the Occupied Zone. We eventually emerged onto a road that led to Chamole. Coffee in the village and then another four kms to Poligny. We went to the Croix Rouge, and where better for help. They arranged for us to go just down the road to the offices of a cement factory owned by an English family. The secretary produced tea in delicate china cups. Then we were put onto a bus to a chateau at St Germain-les-Arlay. There we had baths, meals served by the butler and feather beds to sleep in. Telegrams were despatched to our homes in England. On Monday 4 November, with a gift of 250FF each, we left for Lyon in one of the company's cement lorries. Unfortunately a stop and search at Lons-le-Saunier found us taken into custody by French gendarmes. Next day we were sent to Marseille and lodged at Fort St Jean, at the entrance to Vieux Port, where there must have been 50 or 60 British from the north already gathered there. It was a considered and civilised internment. We had passes out in the evenings and weekends. A social club in the Seamen's Mission taken over by the Church of Scotland padre, the Reverend Donald Caskie, was a blessing and a centre for general intelligence about getting through to Spain or stowing away on a boat to north Africa. At the beginning of November, L/Sgt J Maskell (227) and Pte T Dunkley (226) were released from FS 142 on medical grounds. From Marseille they were repatriated back to the UK by the MMB. Pte P Rooney (238) and Pte T Rainey (257) (both AMPC, captured 18 June and held at FS 142) were also repatriated by the MMB at the same time. On 13 November, another ten men escaped FS 142 via the sewers. Pte A Westhead (391) and Pte Walter McMullen RASC (DetW) got away safely but John Hosea and Halley (RAOC) Crawford (Navy) Jordan, Kelley, Shaddock and Hope (all RASC) were captured whilst trying to cross the demarcation line, and S/128840 Pte Seth Plant (also RASC) shot and killed. Shortly after this the remaining prisoners were sent to Germany and the camp cleared to make way for women internees. We had fairly free circulation of the town at Marseille and minimum fatigue duties. Occasional visits to the cinema and once to the opera - The Barber of Seville. Small donations via the American Consulate provided pocket money. On Saturday 23 November Ken, Johnnie, Stan, Turley (one of the sailors at Caserne Ruty) and I caught the 07.40 train to Narbonne (fare given through the US Consulate) en route to Banyuls-sur-Mer and the Spanish frontier. We reached Banyuls at 09.00 Sunday morning. It was bitterly cold with snow on some of the hilltops. We got by the control on the station but, tempted by the hope of hot coffee, were picked up at a café by some gendarmes who were tipped off. Spent the night in a lock-up and brought back to Marseille on Monday - no punishments. For our next attempt, we spent the night of Friday 20 December at the Mission in order to catch an early train on Saturday. The Representative for Cooks/Wagons-Lit kindly got our tickets once more and saw Ken Wight, Johnnie Cope and me safely on the 11.55 train. Tickets were paid for from our own pocket money this time. We carried bread, biscuits, three tins of salmon, paste and figs from the Padre. We reached Banyuls at 8.30 that evening and jumped out of the train on the side away from the platform. We ran up the line and hid until the train had left and then set off in the dark up the foot hills towards Spain. We reached the top of the first Col (1,350 feet) and had a rest. On in the moonlight until daybreak found us in Spain. Alas, we were spotted by a Spanish border guard at about 09.00 and taken in custody to Port Bou. Next day we were taken to Figueras and spent the day and next night in the local jail. Then we were taken to a police station for another night in cells. On Christmas morning we were taken with some other British to the Castillo at Figueras where British escapers were kept. We were too late to be included in the ration - other inmates shared some of their own food with us but it was more or less a day of fasting. Rations were poor and numbers increased as other escapers and evaders arrived. It was cold and we had no blankets. On 5 January thirty-five of us were taken by cattle truck. We left Barcelona at 03.00 and arrived Cervera at 3.00 in the afternoon. Cervera was equally squalid, all of us equally lousy, the food was a little better but we were always hungry. We slept on the floor with two blankets and a paillasse. We had no working duties and passed our time by delousing our clothes and playing chess. There were fourteen in our cell. There was some snow and the prison water system froze. We washed and shaved with snow. The water for the soup was snow shovelled from the courtyard. On 15 January twenty more men arrived from Figueras, one bringing the compliments of Stan Newell. The weather was depressingly cold. On 18 January another ten men arrived from Figueras, including Stan and his mates Jewitt [Dvr W R Jewitt (315)] and Currie [Dvr G E Currie (318) - both 1 RHA] and also one of the Dutchmen. On Tuesday 21 January we were roused at 02.30 and twenty or so of us, with eight guards, left at about 06.30 to be taken by cattle wagon to Saragossa (Zaragoza). At Saragossa we were booked in as convicts, finger-printed and had all our belongings removed. An enormous room of sleeping prisoners was disturbed and kicked to make room for us as we slotted in, sardine fashion, for the night. We were awoken at 05.30, had our belongings returned and were taken, handcuffed in pairs, to the station. This time we travelled in an ordinary carriage and arrived at the concentration camp of Miranda-del-Ebro at 2.30 in the afternoon of 22 January 1941. There were other British there and we were told that the Military Attaché had visited the previous day. Those of us below the rank of sergeant were soon put to fatigues, mainly peeling potatoes. Food was more plentiful but not adequate. There was a canteen selling sandwiches, figs and oranges if one had money. One sold one's belongings. On Wednesday 5 February the Military Attaché arrived at about 4.00. We were all given 50 pesetas and I signed for a further 50 with which to repay my borrowings. He also brought some clothing (pullover, socks, balaclava) and some cigarettes (State Express 333) and some tins of food. Thirty-five British left with him - it was very heartening. State Express 333 cigarettes were sold with the slogan "At ease with threes". Life at Miranda was pretty dreary. There were occasional snowfalls but sometimes warming sunshine. There was a parade each morning for the ceremony of raising the Spanish flag and at dusk for its lowering. The incantation for the evening procedure was to give the Falangist salute while chanting "Espana Una, Espana Grande, Espana Libre, Viva Espana, Viva Franco". One got thumped with a baton for not giving the Falangist salute but having no capacity for foreign languages, the British responded with anything colourful that came into our heads - until it came to Franco, when there was an unrehearsed alliterative unanimity. We reckoned that made it honours even for having to give the fascist salute. Spain seemingly has come to no harm from the uncomplimentary sentiments, nor Franco for that matter from our vigorous incantations. I had a fair amount of stomach trouble, rheumatism and painful toothache (a filling had come out in July and I had since stuffed it with cotton wool). There was a medical room but all one got was Aspirin. One played chess or cards to pass the time. There were some American magazines but it was a wearing experience despite the evidence of eventual release. On 7 February, about a hundred French were returned to France. On Tuesday 25 February the Attaché arrived to conduct our release. To our confusion and dismay, Ken Wight was not included and left behind. We discovered later that due to a clerical error he was listed as Wight Kenneth and so suffered several further weeks incarceration (he was finally released on 19 April 1941). We left at 11.00 and given a carrier with rations (three sandwiches, half bottle of wine and two oranges) for the train journey to Madrid. We arrived at the Embassy 9.00 that evening. Had a bath and swapped our lousy clothes for fresh ones. Then we went to the Hotel Mora [a short distance down the road on Paseo del Prado] for supper and a good night's sleep in a proper bed - shared the room with John Cope and Pte F S Tym (251). I talked to Colonel Woolf Drummond [he was still Military Attaché when my father was there in November 1941 - Ed] and gathered that about a hundred and seventy British escapers had come through. We left the hotel at about 07.00 for the station - we had 10 pesetas for the journey and reserved seats in a crowded train. We arrived at Malaga at about 1.00 on Thursday 27 February where the Vice-Consul and his wife met us. We were taken by taxi to an hotel for lunch and then another taxi took us about 25kms along the coast to get a bus for Gibraltar. We reached Gibraltar at 9.30 to the welcome sight of British-style bobbies and a supper of two eggs and sausage.